August | 2017 | Superhero etc. Hello interweb, Nate here! 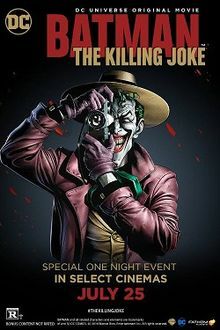 So a while back I reviewed the animated movie Batman: The Killing Joke. Now I just got done watching the recent animated movie Batman and Harley Quinn and I was in the process of writing up a review of the film. I made a reference to this review and when I went to link my Batman and Harley Quinn review to this one I realized that this review reverted back into a draft. I’m not quite sure why this is or what happened but I decided to republish it with as few edits as possible. This is, word-for-word, my original review of the animated movie. I guess you could consider this a “Lost episode” if you want. Anyways, this is a spoiler warning review and enjoy! Stay tuned for my review of the Batman and Harley Quinn animated movie!